Low pressure crosses southern New England this morning then heads through Maine and into eastern Canada this afternoon and tonight, and really expands through the Maritimes Saturday, doing that typical early spring kind of thing, pulling cold air out of Canada along with producing plenty of wind. So our wet weather of this morning will be replaced with rain to snow showers tonight and early Saturday, then eventual clearing. This will lead to a much nicer second half of the weekend as high pressure slides southwest of the region and pushes milder air into the region. But this will be very short-lived as a sharp cold front will drop out of Canada and turn Monday into an upside down temperature day along with at least lots of cloudiness and some potential precipitation, and finally a dry and cold day Tuesday. TODAY: Overcast with areas of fog morning as rain, and some higher elevation mix/snow briefly, tapers to isolated rain showers and patchy drizzle. Mostly cloudy afternoon with a risk of a passing rain shower. Highs 40-47. Wind backing from E to N to W 10-20 MPH, higher gusts especially this afternoon. TONIGHT: Mostly cloudy. Scattered rain showers evening. Scattered to general snow showers overnight with minor accumulation possible, generally patchy coating to 1 inch amounts but 1-3 inch amounts in higher elevations of northern RI, central MA and southern NH. Lows 30-37. Wind W increasing to 10-20 MPH then shifting to NW with gusts 30-40 MPH. SATURDAY: Mostly cloudy with snow showers likely morning. Partly sunny afternoon. Highs 40-47. Wind NW 15-25 MPH, gusts 30-45 MPH. SATURDAY NIGHT: Partly cloudy. Lows 30-37. Wind NW 10-20 MPH, gusts 25-35 MPH. SUNDAY: Mostly sunny. Highs 50-57. Wind W 5-15 MPH, higher gusts. SUNDAY NIGHT: Mostly clear. Lows 35-42. Wind W 5-15 MPH, higher gusts. MONDAY: Clouding over. Risk of a period of rain that may end as snow. Highs 48-55 but a quick temperature drop is possible later. Wind W 10-20 MPH eventually shifting to N.
MONDAY NIGHT: Cloudy evening, clearing overnight. Lows 20-27. Wind N 5-15 MPH. TUESDAY: Sunny. 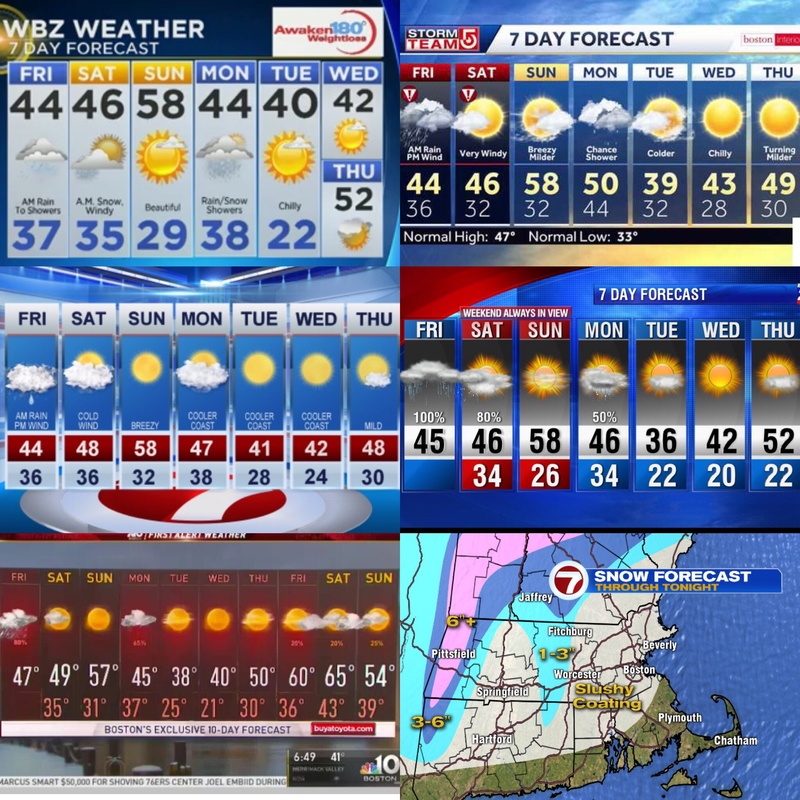 Highs 36-43. Wind N 10-20 MPH. Look for mainly dry weather and a warming trend with temperatures starting the period near to below normal and peaking at much above normal around March 29 or 30 before a cold front knocks them back to near normal at the end of the period. A cooler first few days of April with unsettled weather possible early and again late in the period. It will be interesting if Logan adds to its seasonal snow total by tomorrow. Thank you TK and Happy Friday to all. Good morning and thank you TK. As of 8AM, 1/2 inch rain at my house in JP. 11-5 on my brackets after Day 1. Picked Murray St. Almost had Belmont over LSU. Bruins (Belmont Bruins, that is) lost by 2. As of 9:00 AM only Logan and Blue Hill obs. available. Based on radar, snowing like crazy from central NH into most of Maine. Good morning and thanks TK. I have 0.90″ in the rain gauge….it had been pouring before the changeover. Epic powder weekend of skiing on tap in the Adirondacks, VT, NH and ME! Snowing moderately to heavy in many mountain areas now as Phillip alluded to. I am going to try and get up there tomorrow if I can. Killington and Gore were already reporting up to 4″ of new snow as of this morning with a lot more on the way through tomorrow as the backside/upsloping snows takes place. Going to likely to see a lot of 10-20″ amounts in the higher elevations come Saturday evening. As I mentioned earlier, if this was a benchmark event, SNE ski areas would be in it as well, local, not just the Berkshires. Now all snow and HEAVY. This was a picture a took about 10 min ago but it has ramped up further since then. Even the driveway and road are completely snow covered now. There were snow flakes mixing in with the rain where I am. Some places in CT including where Mark is the snow is whitening the ground. 12-4 yesterday with my picks in the NCAA Tournament. It was a fun day watching the games in Hartford. JA Morant with the price of admission for the game he had for Murray State. Belmont and Seton Hall hurt me yesterday. Which is why I don’t do the brackets anymore. Too many Cinderella teams nowadays. That’s what makes it fun!! I hope SNE can get some widespread snows overnight into tomorrow morning. Wow Mark, send that a few miles north! We are mixed rain and snow here at the moment but nothing quite like your having. That nearly stationary blossoming of precipitation near the mass/ct border that is fairly heavy, is that a deformation line? Glad you had a great day yesterday, JimmyJames. Some great games in Hartford. I was in the Providence Civic Center in 1989 when Princeton nearly pulled off the greatest upset of all-time against Georgetown. Heavy rain (almost a south-to-north squall line) pivoting through Middleborough now. Captain was that the year Princeton was a 16 seed? I always said one day we would see a 16 beat a 1 and it happened last year. I never thought it would be in a blow out though. I am at 750 feet elevation but just heard from the office in Manchester (150′) that it is snowing there now too. Still snowing very very hard. If this weren’t mid March, we would have had 6″ by now. This is 3″ per hour stuff easy if we were in mid January. Certainly depicts those fat flakes. Just good ole RAIN here. Those pictures are showing what were seeing on radar in that part of CT is snow and not rain. White conditions on Wildcat. Guessing 6” easy at the base , much more up top. coming down at UConn. All this in about a half hour. Awesome Mark. I thought I saw a bit of snow mixed with the rain when I was out earlier. Something is off with my rain gauge. It says nearly 3 inches and the other day when we’d barely had any it said near 2. It is coming down this weekend since kids got a new swing set. I’m wondering if ice is caked in there. Nearest station to me that I feel is most accurate says just under an inch. I knew this storm had some serious potential for upslope snows on the back side, just wasn’t expecting them here in the hills of NE CT.
1.3″ here now. I cant stress enough that we would have 2 or 3 times this amount had this occurred overnight or during the winter months. The snow was extremely intense for the past couple hours and even now, still coming down moderately. Amazing parts of CT look like a winter wonderland right now whole other parts have showers and temps in 40s. mixing going on. Probably not, but I shall see. Let us know if anything blops or pings on your windshield. Currently Maine is literally split in half regarding rain (east) vs. snow (nw). Earlier almost the entire state had heavy snow. sitting in the car. SLEET pounding. Perhaps a good sign for later tonight? Didn’t last. Mixed on the way home, then it was basically rain again. Superstar webcam at Killington. Whiteout…. 7″ new so far at Killington as of two hours ago and plenty more yet to come. Winter Weather Advisory now up for my area (Tolland County CT) tonight for 2-4″ of additional snow. Tolland County and the east slopes of the Berkshires are the only locations in the NWS Boston forecast area under an advisory tonight. Don’t see that too often. We warmed up to 37 degrees here this PM and changed to light rain. We still have patches of snow but a good portion of the 1.5″ that fell earlier has melted. 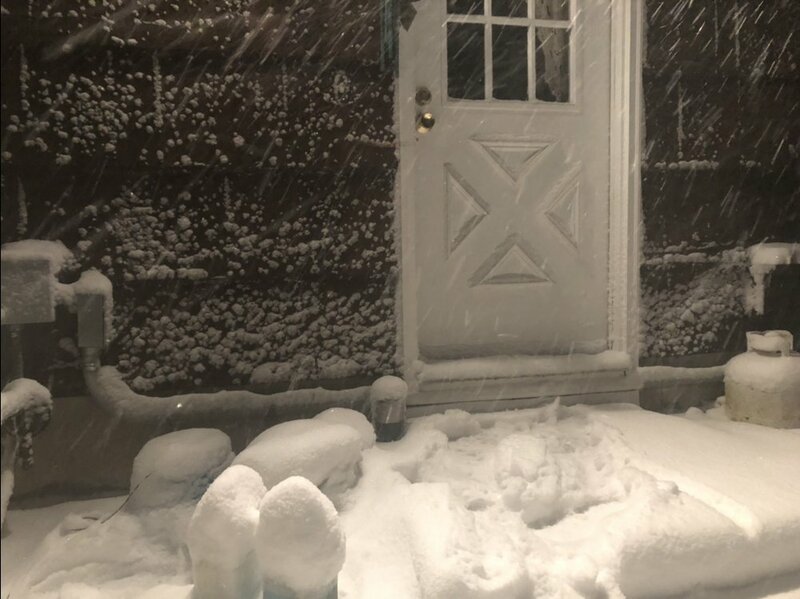 As of 4PM…..Mad River Glen, VT reporting heavy snow and 12-17″ new since this AM with an additional 6-12″ expected tonight! Jay Peak, VT…..9″ new as of 3PM with 12-18″ additional snow expected. Now up to an incredible 379″ on the season and looking like 400″ is in the bag. Those are Sierra Nevada type numbers! I’m in Seattle working at a conference. Very different weather here. Very tranquil. Perhaps a passing shower this evening, but otherwise typical spring conditions for Seattle, which means weather that is not variable in temperature and only includes an occasional shower. I learned something from one of the weather persons in Seattle last night on TV. 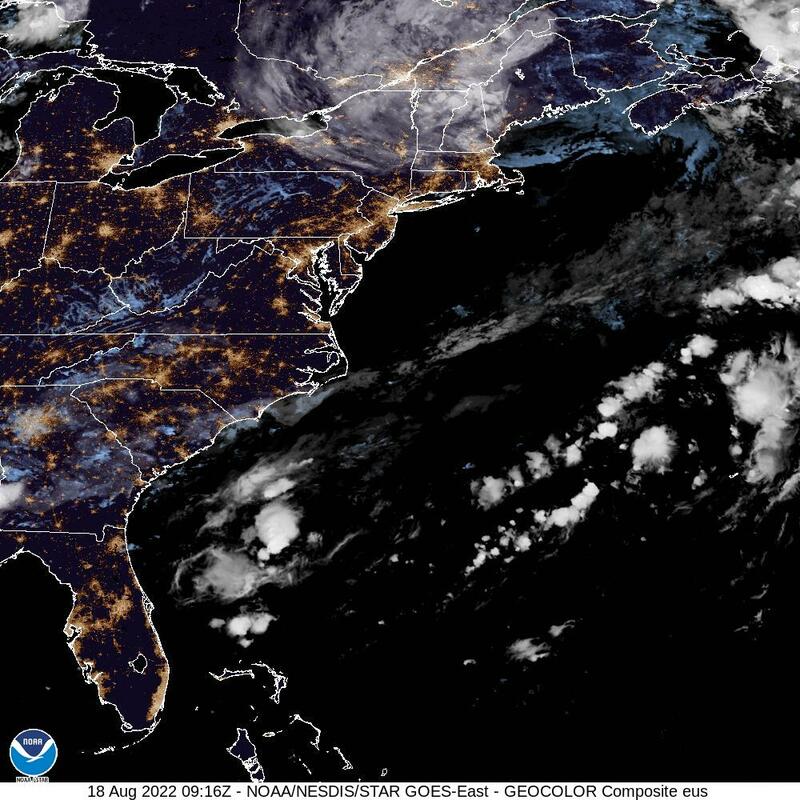 He explained that the current long stretch of tranquil weather is typical due to a “split flow,” essentially Seattle and the Puget Sound area are between two active jet streams, but “not sandwiched” between. Instead, the area is far from either jet stream. This translates, according to the weather guy, into daytime temperatures that barely fluctuate from day to day for weeks – between 55F and 60F, and basically not much at all in terms of weather. “No all-day rain events like we had during the winter months,” according to the met. The weather person did add, however, that this entire region is suffering from significant water deficit. This has been a theme for years around here, actually. Coating of snow where I am and snow coming down at a good clip with a bit of wind. Started as rain here in Woburn around midnight. Mixing with snow now. Just woke up and holy crap!! 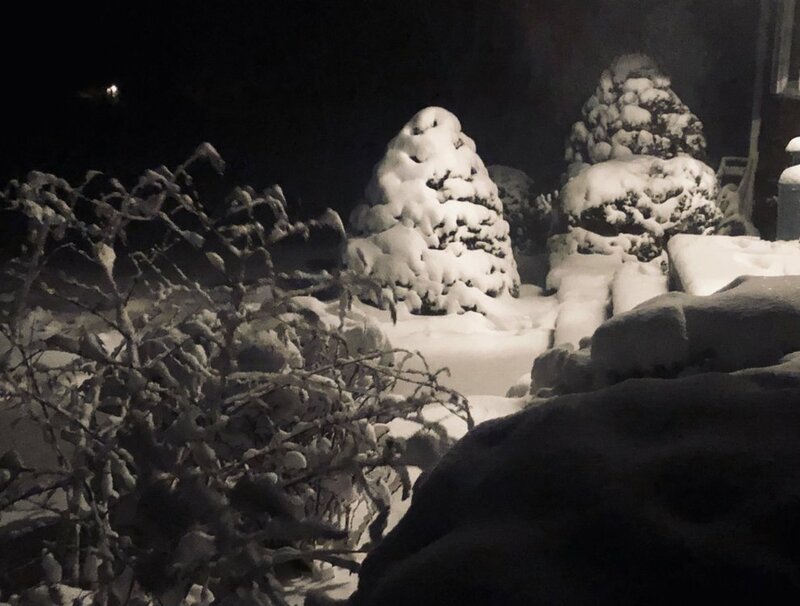 We have 6″ of snow in Coventry, CT and temp is down to 24F! Still snowing heavily with blowing snow and near whiteout conditions. This is nuts. And the NWS apparently cancelled the Winter Weather Advisory for Tolland County?? They should have upgraded to a Winter Storm Warning!! 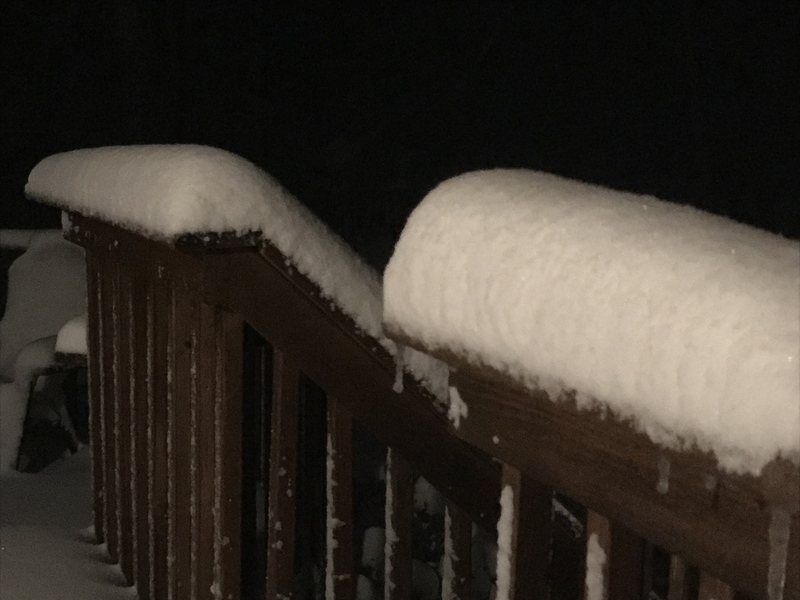 I have not been out to take pics yet but here are a couple shots someone just posted from Tolland (about a mile north of me)…. This is crazy…shaping up to be one of the biggest storms of the season here and with near blizzard conditions to boot. Definitely the biggest upslope/orographically enhanced event I have had since I’ve lived here. And still coming down hard…. It shows the band of heavy precip being wrung out and it appears to be occurring over the CT River Valley but it is actually being displaced and falling over the hills of Tolland County about 10-15 miles east of where it is showing. I have noticed radar signatures like this in the Greens before in upslope events. The strong westerlies actually displace the snow east of where it is being shown on radar and wring it out over the higher elevations. I am only at 750′ but boy what a difference it is making. This has been 1-2″/hour stuff for the last 4-5 hours! My brother is in on that in Manchester. Well, he watches every game of the NCAA and he runs a pool so I can relax at home and let it melt I guess! I got about an inch of snow this morning. Mark your part of CT got the jackpot and the HREF model yesterday was showing your part of CT would be the jackpot. Heading up to VT to do some powder skiing! Driving through Manchester and Hartford, 15 min west of me, there is barely any snow at all. Blades of grass are showing. Total elevation event! 30” of new snow reported at Mad River Glen! It will be interesting if Logan received any measurable snowfall to add to its seasonal total to date of 27.4 inches. I hope at least a couple tenths. JP to 40.65 inches. Who would have thunk…..
On 91 in W locks, bare ground and dry roads. Incredible. Amazing it looks like a winter wonderland in parts of CT while other parts of the state nothing. Maybe 1-2” here in Holden. Love you all but one day closer to me moving from this AWFUL climate.